Click here to RSVP and pay for this meeting by Friday, May 25th. Join us as the team from RESCUE! 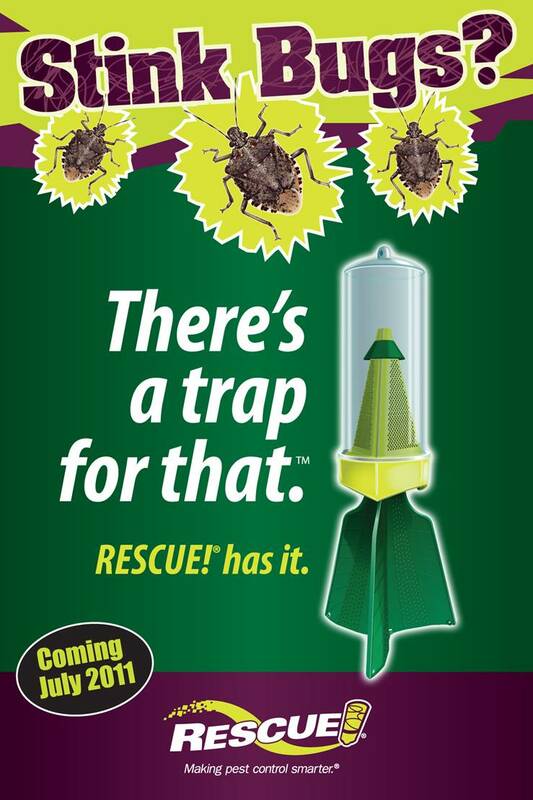 Pest Control Products presents on their Dussault Award winning Stink Bug Trap Product Launch. More than just bug traps! Come prepared to learn about the RESCUE! Marketing Department’s overall strategy and execution of this integrated marketing campaign. This catchy (pun intended) campaign wowed this year's Spark Award judges and was chosen from the Brightest Spark Awards winners at the discretion of the judges. This “best of show” award received high scores and was recognized as a campaign that had a significant impact on the economy and prosperity of our region. You may have noticed on Facebook recently, that I have gained an interesting nickname. Or perhaps I should say Steve with Sigma Design was best able to personify my alter ego. At press checks and such, I have been told I have a “discerning eye,” but Steve took it a step further referring to me as the “Eye of Sauron” — the fiery, unblinking eye from Tolkien’s Lord of the Rings. At first I wasn’t sure whether to be proud of my gazer beam tendencies or a little ashamed to be compared to the ultimate dark lord. Needless to say, I took the good with the bad and have now owned it. In my role as Brand Manager for RESCUE!, the unblinking eye is necessary to maintain our overall image. But if it’s o.k. with you, we’ll just overlook the part where my emulated character sends out an army to destroy Middle Earth. My ambitions do not include absolute power. After receiving a Pez set from the MarCom Board that features the eye and other Lord of the Rings characters (see below), I began to view the board as a fellowship of sorts. The board works as a team to maintain and constantly improve our marketing and communications community. For my final editorial as MarCom President, just for fun, I bring you the Fellowship of the MarCom Board. Each member working tirelessly to represent our mission to network, learn and share. Sally Mildren, Vice President, Incoming President and Programming Chair: In need of a unique concept or perspective? Seek out Sally. She is able to conjure ideas out of mid air with ease. For MarCom, she harnessed the strength of our membership through the development of Cocktails & Conversations events and “Expert’s Edge” newsletter guest commentary. Ashley Martin, Past President: With poise and grace, Ashley makes all her board endeavors appear effortless. She is a natural leader and as outgoing president this year, her experience and direction has been a great asset. Crystal Schaeffer-Flynn, Sponsorship Chair: Toiling the business mines of Spokane, Crystal scours every nook and cranny for gems we call sponsors. For two years, she has successfully filled the caverns, making it possible for MarCom to award $6000 in scholarships to its student interns. Leslie Czernik, Events Chair: Behind the quiet and humble facade, Leslie has seamlessly produced and directed MarCom’s most anticipated event, the Spark Awards. Whether she knows it or not, I know Leslie is destined to do great things for MarCom in the coming years. Judith Van Dongen, Finance Chair: Her first year with this fellowship, Judith readily accepted her role and has performed it well. She keeps all of us accountable for our contracts, budgets and expenditures – and brought our events into a new era with credit cards accepted at the door. Tyler Tullis, Internship Chair: Fellow board member Sally best describes Tyler as a can of soda you want to shake up and unleash on the world. We expect nothing less from someone who strives to emulate Dwayne “The Rock” Johnson’s “I bring it” attitude. In Tyler’s freshman year with the board, he developed a simple, yet effective job-seeking tool for students – The P.E.N. Model (Preparedness, Enthusiasm and Networking). Kevin Dudley, Spark Awards Judging Chair: Steadfast, calm and collected, Kevin is a grounding force for the board. No matter what situations are presented to the stressful role of judging chair, Kevin tackles each one head-on with sound solutions. Breanne O’Doherty, Membership Chair: This not-so-plain-Jane-of-all-trades has worn many hats in this fellowship. A true team player, Breanne has successfully spearheaded sponsorship, Spark Awards and membership efforts in her three years with the board. Nichole Kerns, Communications Chair: Keeping us on our toes each month, Nichole is responsible for the newsletter, website and media relations. It’s not easy reminding all of us of the deadlines for our articles and sticking to those deadlines, etc., but Nichole manages it perfectly. A fellowship worthy of any quest! Perhaps each year the MarCom President feels this way, but I truly believe I have been blessed with an amazing board of individuals who have come together in fellowship to perform awesome feats; such as a new website, a workshop with nine guest speakers, the Spark Awards with new and fun photo opportunities, three internships and, as always, incredible programs for our monthly meetings. Thank you to everyone for believing in me and trusting me to perform as your MarCom President this year. I originally joined the board as an opportunity for growth, without any idea of how much it would positively affect me and stretch my abilities. MarCom takes a small break after the June meeting. We’ll return with our annual summer social and a few new board members to join the fellowship. This time of year always reminds me of the common yearbook inscription, have a great summer! Congratulations to all our 2012 Spark Award winners! If you want an additional copy of your award, be sure to submit your Spark Award reorder form by May 22nd. Click here to download the form. Contact Leslie Czernik atlczernik@pearsonpkg.com with any questions. We’re taking the summer off, but not for long! Be on the lookout for details on the MarCom Summer Social coming this August. See you then! In the deliberations of the internship committee, Megan quickly earned the label of “the go-getter.” She has extensive experience in event planning through her work with Port Madison Enterprises. Megan sees herself working at a PR/marketing firm after graduation, so we were happy to place her with BHW1 and Account Manager Kelly Fry, with whom Megan will help develop communications strategies, conduct research and support several client accounts. An accomplished and published writer, Ally is a contributor to a college fashion website, aptly named CollegeFashion.com, and an editor of the Gonzaga yearbook. Involved with Freshmen Orientation and dance team at GU, this summer Ally will find herself at camp with Maggie Crabtree at Camp Fire. Aside from the fun getting to attend camp herself, Ally will put her skills to use assisting with rebranding, media relations, event planning and social media support. Heather is the secretary for Elon University’s PRSSA chapter, through which she has presented at the 2011 PRSSA National Conference on social media integration. She is also the Assistant PR Director of Elon’s PanHellenic Council. Heather will put her PR skills to use for Encoder Products Company under Steve Diltz in Sandpoint, ID this summer. She will write corporate communications, gain sales experience, and produce materials ranging from videos and webinars to slide decks and infographics. On behalf of the entire MarCom Board of Directors, we just want to say thank you to all of this year's Spark Award Sponsors. Your generosity helped us raise over $2,400 to support our internship program. Your support is greatly appreciated. For a complete list of this year's sponsors click here. If your organization is interested in sponsoring an upcoming breakfast or the 2013 Spark Awards contact Crystal Schaeffer-Flynn, fundraising chair atcrystal.schaeffer@cancer.org or 509-242-8291. A blank page has been staring at me for about an hour now, the white page taunting me with its nothingness and mocking me for my failure to produce even one … simple … word. But wait! I’ve faced this demon before. Over thousands of battles with it (some call it “perfectionism,” but for me that word has enough of a positive connotation as to mask its paralyzing nature). I have tried many weapons: task lists, calendar tools, and fancy productivity methodologies. All have shown promise, but none have worked fully and some have just distracted me from the actual task at hand. My failures to conquer it have left me frustrated and perpetually behind in my quest to stay on top of my ever-growing workload. Recently, however, I’ve come across a weapon in my fight against perfectionism that has propelled me to victory, or at least to the next best thing: DONE. That weapon is crap. You see, as someone who takes pride in my work, I’m loathe to let it out into the world until it’s infused with with every ounce of creative energy, thoughtful reflection, and technical polish that I can muster. Trouble is, I don’t think I’ve ever actually achieved that nirvana, so instead I’m left staring at a blank page, struggling to take that first step toward completion. Thus I’ve learned to embrace the idea of creating a “crappy first draft.” Framing my initial attempt at work – be it a piece of writing, project plan, creative concept, or whatever – in that perspective allows me to focus on producing something and frees me from the angst I feel at the beginning of a project by knowing from the start that it’s not going to be great. I’ve also found that completing that initial draft gives me an endorphin-laced sense of accomplishment and the momentum to keep moving toward completion. Don’t get me wrong: Releasing something that I know isn’t perfect is still a scary prospect for me. But it’s never as bad as I my mind anticipates. In fact, I’ve found that letting let others review and react to my work in its early stages often invites criticism that makes the final product better or praise that lets me know I’m on the right track. While it may still take several versions to arrive at something I’m satisfied with, the most important one is clearly that first, poorly-composed, jumbled mess that gets me out of the starting blocks. Therefore I submit to you my finished column. Sure, it’s probably not perfect, but I think it’s good enough. And perhaps more importantly, it’s DONE. Now I’m free to move on to my next project, satisfied in knowing that I’ve won this battle against perfectionism. All thanks to a little crap.